He’s honestly acting like Trump! And I thought it was me as I read this, thank you for saving my sanity. This to me is Cuomo thinking he has an actual shot at becoming President in 2020 and doing all of this ahead of announcing a bid for President. If that is the case, although this would have little or no effect early on with states like Iowa, etc., if Cuomo got through there to New York, New Jersey, Connecticut and to a lesser extent Pennsylvania, THAT is where Cuomo likely is concerned a shutdown would negatively affect him. Quite a few in other forums also think his donors demanded he do this. Does it mean Cuomo actually does have a chance? Likely no, but what we may think likely doesn’t matter in this case. The New York Times details in an article today that the “Cuomo plan” was considered way back by the MTA when the initial planning was done and was discarded due to the risks. Specifically, drilling for cable anchors in the old concrete lining of the tunnels was deemed too risky to cause leaks and additional concrete deterioration. The selected removal of the benches was a concern due to inability to contain silica dust in an environment of constantly setting up and taking down protective measures (any left over dust will be spread over the full tunnels by the trains operating during the non-shitdown times). The conclusion is that the MTA is not as stupid and incompetent as Ben and others would like us to believe. The MTA has made a lot of mistakes, but not considering the options outlined now is not one of them. Also note that Byford is by no means on board with this. He wants an outside consultant to sign off on it. This is a typical move of someone who senses an impeding disaster and wants to ensure that there is no chance he gets blamed for it. Cuomo and company will definitely find a consultant to sign off on their plan. In this day and age it is pretty easy to find a consultant that would sign off on anything. Will the consultant be on the hook for the billions of dollars to replace the L tunnel 10 years from now if the drilling for the anchors damages the tunnel beyond repair? I don’t think so. It will be the taxpayers who will cover the bill. 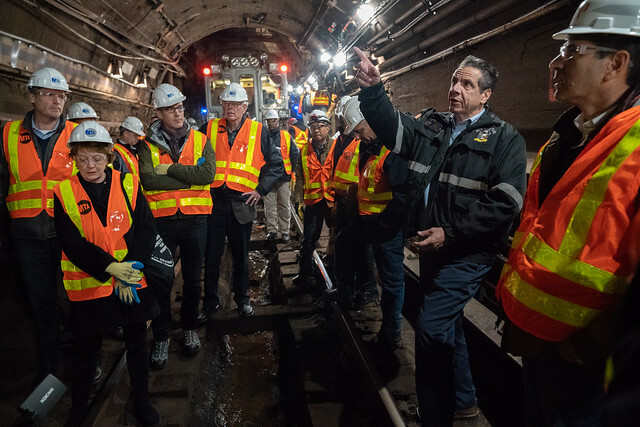 As I might have said before, the “Cuomo plan” of anchoring to the walls is standard practice in new tunnels, but that is new specialized concrete with additives and such making it much less likely to crack. The liner of the L tunnel was poured almost a century ago when concrete was still a novel material and it is nowhere close in quality to the modern stuff. This sounds more and more like making an uninformed bet on the state of a century old concrete liner. It might or might not work out, but I am glad I am not the one on the hook if the odds come the wrong way. The conclusion is that the MTA is not as stupid and incompetent as Ben and others would like us to believe. Yes. I think there are plenty of other reasons to question the MTA’s credibility and the agency’s overall ability to budget and manage construction projects. But Emma’s reporting in The Times significantly changes the analysis on the L train. I’ve been addressing that on Twitter via this thread and a separate side thread with Stephen Smith. I’ll address it in a post, likely with an update from today’s board meeting. The MTA Board has apparently refused to keep borrowing more and more money, pledging the future of the metro area transit system and economy as collateral. Therefore, their usefulness to state politicians is at an end. They’ve done as much damage as they can do. So in your eyes what comes next assuming the MTA board is useless. Am I the only one who thinks hanging service cables from the damn ceiling of a tunnel is NOT the best way to go here, long-term? Isn’t there a reason they were embedded in concrete in the first place? Is this Cuomo’s genius idea, to hang critical cable infrastructure from the top of a tunnel just inches away from trains going 40mph? The cables will be on the side walls not on the ceiling. This is standard practice in new construction. What I am not buying is that this is OK to do in a tunnel as old as this one. I also do not buy the idea that the cables can be hung by themselves rather than in metal pipes. This is an environment where they are subject to damage, so exposed non-metallic sheathing is a bad idea. While people claim that plastics that do not burn or smoke can be used for the insulation, what about the time when a backhoe or other track maintenance equipment hits and damages the insulation of the cable? And that’s how the dysfunctional MTA was, is and always controlled by the governor since its inception in 1968, from Rockefeller to the superbly hypocritical Cuomo.